Successfully Added Camera Clock (Motion Detection, 30FPS, Pinhole Lens) to your Shopping Cart. This brand new hidden camera clock looks and works just like a normal table clock. However, hidden within the 12 o’clock time marker is a virtually undetectable pinhole video lens! The I66 clock records beautiful 640x480 videos directly to a Micro SD card and at 30fps (frames per second) for smooth motion capture. This ensures all your surveillance videos will always look as clear and detailed as possible. And to make things even better, this device even comes with motion detection recording to record video only when objects are moving in front of the lens! Do you suspect that someone is stealing from you? Or that your loved one is cheating while you’re away? How about the teenagers, are they drinking when they should be in school? Well now you can finally know the truth- once and for all. Just place this clock on your nightstand, living room, or office desk, and come back the next day to review all the activity for the day. You may be surprised at what you find! The build quality of this clock is simply stellar too. You only need to pick up this device to notice its solid feel and robust design. This is because the I66 is crafted from full stainless steel that is polished to give this product an elegant finish which complements any home or office decor. If you’re looking for an elegant yet durable device then you have found the right product. 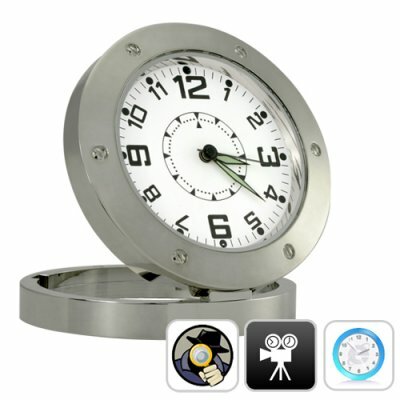 With easy one button recording, high quality pinhole lens, and solid yet elegant design, this clock is sure to become a top selling item for 2010. If you are a reseller this is a good chance to sell a unique device before anyone else. Place your orders now and we will express ship your order by tomorrow. And don’t forget, the I66 is backed by our famous 12 month guarantee and is in stock now. Available only from the leaders in wholesale electronics, Chinavasion! Video automatically saves after 30 minutes, then begins recording again. Stylish looking clock matches any home or office décor. Yes, it records video with audio. However, the audio recording also picks up the sound of the internal clock that is ticking which may effect the final audio quality. nice looking clock,keeps acurate time. the maximum recording time is 1.5 hours with one charge of the battery. you can hear a beep while watching the video, its the frame rate but its not a problem.